"The Bravest Girl You'll Ever Meet"
An Associated Press story about "The bravest girl you'll ever meet," in the words of a tweet Monday from the reporter, is winning kudos for its emotional power and its journalism. The story tells of a 10-year-old girl with polio who cannot walk and is left to fend for herself in a forest in the midst of a war between Christians and Muslims in the Central African Republic. "When gunfire rang out through the village just after dawn, when neighbors dropped their coffee to flee, even when her mother grabbed three younger children and ran for her life, the 10-year-old girl did not move. "It was not that terror pinned Hamamatou Harouna to the ground, although she was terrified. It was that polio had left her unable to walk. "So all she could do was wait and watch, paralyzed, as the vicious war between Muslims and Christians in Central African Republic came to her village. The Christian fighters were going from door to door, and she wondered if she would die. "That's when her 12-year-old brother came to her rescue. Barely bigger than his sister, Souleymane struggled to hoist her, all 40 pounds of her, onto his back. Around his neck she clasped her calloused hands, dirty from pulling herself over the ground. "They set off, barefoot, disappearing into the dense tropical forest as fast as they could manage. Her legs could not hook onto her brother's back, and her body drooped like a dead weight. "Hamamatou had never felt so heavy in her life. . . ."
At a meeting with members of the Association of Opinion Journalists in April, State Department officials said they counted three major humanitarian crises in the world: in Syria, in South Sudan and in the Central African Republic. However, only Syria is receiving much media attention, and lack of coverage elsewhere can cost lives. Media attention brings funds to nongovernmental relief organizations, saves lives and guards against leaving swaths of territory unprotected and lawless, to become breeding grounds for worldwide terrorism, they said. As the AP story explained, "Over the past year, conflict between Muslims and Christians has killed thousands of people in the Central African Republic, a nation of about 4.6 million that sits almost precisely at the heart of Africa. As families flee, it is often children who carry the weight of the crisis on their backs. "Nearly half a million children have been displaced by violence in the country last year, with many hiding out in forests, according to UNICEF. Hundreds have become separated from their families, lost or simply too slow to keep up. "That's what left Hamamatou and her brother trudging along the red dirt path on an unlikely journey that would reflect a world turned upside down by the complexities of war. The AP pieced together the story from interviews with the girl over two weeks and information from witnesses, health workers, priests and medical records. . . ."
So far, the saga has at least one happy ending. A Christian family rescued the Muslim Hamamatou, although she has not since seen the brother who tried to carry her and left to get help, nor the mother who grabbed the other children and fled. "There are three other girls with polio here, only one of whom has a mother to look after her. 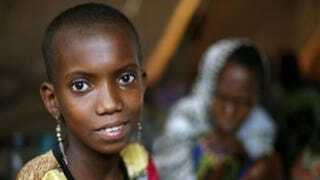 Hamamatou has been diagnosed with malaria, and her braids were shaved off because of lice. Just to go to the toilet, she must crawl past a maze of shelters until the red mud, still wet from showers, cakes her forearms and feet. . . ."
On Twitter, readers were moved. "Can this girl be adopted?" asked one. "Thank you for a truly amazing, fantastic piece of journalism. Hope it gets many many readers," said another. "Hamamatou a'yeke wali gongu mingui'. Sango for 'Hamamatou is one strong woman,' " said a third. On the Facebook page of the Afro-American Newspapers, the story has been seen by more than 14,000 people, "liked" by more than 600 people and "shared" by close to 100 people so far, Jake Oliver, the Afro's publisher and CEO, told Journal-isms by email on Wednesday. "This tear-jerker reflects through its comments how sensitive our community is to the hardships and violence of war, regardless of what religion may be involved — even when the conflict is thousands of miles away," Oliver messaged. "The comments also show how we continue to respect and use the power of the 'almighty' blessings of prayer." Larson tweeted to her Twitter followers Wednesday, "Thanks to all who want to help Hamamatou. We are trying to coordinate best way and I promise to keep you all posted."
. . . "She Stole Our Hearts With Her Determination and Bright Eyes"
"I was in Carnot, Central African Republic to do a follow-up story about the Catholic church that was sheltering 900 Muslims. AP Photographer Jerome Delay spotted Hamamatou crawling through the mud on her way back from the communal toilets and snapped her photo. She stole our hearts with her determination and bright eyes. "I went to her tent with my Sango translator and we did a first interview. I contacted my editor Mary Rajkumar in New York, who gave me more suggestions for questions to ask and people to talk to. We then interviewed her several times over the next day or so, and then we went to her home village of Guen where we learned more about the attack her family had fled. "Then we traveled hundreds of miles to Garoua-Boulai, Cameroon in hopes of finding her mother and brother (we ultimately did not succeed), and we distributed dozens of her photos in case her family would come later. On our way back we came through Carnot again and met with Hamamatou, and also talked to the priests and [Doctors Without Borders] health workers who had been involved in her care. . . . We are working with aid agencies to see if they might be at one other location. "It's been touching to see how many people have reached out to help Hamamatou despite a lack of international interest in the conflict ravaging her country. "What moved us most about Hamamatou was her determination and her strength, but also the fact her unlikely story underscores the complexities of this conflict. Her own mother left her behind to die, and then her life was saved by the one person she thought would take it. They often speak of it as a Christian-Muslim conflict but in fact there are shades of gray and signs of hope that these two communities can see each other as humans first and eventually live amongst one another again. The Commercial Appeal in Memphis has reassigned Wendi C. Thomas, its only columnist of color and only female columnist, in a reorganization focused on its digital platforms, Editor Louis Graham told readers on Wednesday. Thomas, the paper's first Metro columnist ("at least in my memory," Graham wrote) told Journal-isms by telephone, "It came as a complete surprise. I am sad to be losing my column." However, Richard Thompson wrote on his Mediaverse Memphis blog, "there's some internal discontent with the move but Thomas may have little recourse. She's a management employee and not a member of the Newspaper Guild, the bargaining unit, which has historically challenged such moves by management." Graham said Thomas would lead "expanded coverage of crime and justice in the Memphis area . . . . Thomas' reassignment is part of the continuing realignment of resources to support significantly increased offerings to readers online and on mobile devices. She will lead a three-member team and continue to write as part of the new assignment." The city of Memphis is 63.3 percent black, and Shelby County, which includes Memphis, is 52.8 percent black. Mark Russell, a black journalist, was named managing editor of the newspaper last year, but Otis Sanford, who was editorial page editor, moved to the University of Memphis in 2011 but remains a Sunday columnist. The paper reported a staff of 16.4 percent black journalists in last year's diversity survey of the American Society of News Editors. Thomas has written her column for 10 years. She said she had covered police and courts in previous jobs and had filled in as interim metro editor at the Commercial Appeal. She said she would bring a different perspective to her new assignment. "I don't have any interest in sensationalizing," she said, but rather "putting things in context." For example, Thomas followed up May 28 on a county commission meeting in which Henri Brooks, a Democrat, "squabbled with fellow commissioners over the high percentage of Hispanic employees and low percentage of African American workers at a county roofing contractor," noting that his "legitimate concern was lost in the outrage over Brooks' abrasive treatment of a Hispanic businessman." But although Shelby County has not tracked the share of contracts awarded to minority/women business enterprises in more than 20 years, Thomas found a private study that showed, "From July 2003 through December 2007, the value of private-sector commercial construction projects awarded to prime contractors in the Memphis MSA was $1.16 billion. Of that $1.16 billion, $1.15 billion, or 99.24 percent, went to white male companies. White women received $8.78 million, or .76 percent. "Blacks, Hispanics, Asians and Native Americans didn't receive a single dollar — even though in 2012 African-Americans made up 46.1 percent of the Memphis metro area, Hispanics 5.2 percent and Asian 1.9 percent. . . ."
Thomas said she planned to write more on her personal blog and on her personal Twitter and Facebook accounts. "So much for Pharrell’s happy world," Abby Phillip wrote Wednesday for the Washington Post. "The 'Happy'-singing music star, apparently tired of Mountie culture, traded his signature Smokey the Bear chapeau for a Native American headdress on the cover of Elle UK. "The cover photo has incited anger and disappointment — and prompted Pharrell to apologize.
" 'I respect and honor every kind of race, background and culture. I am genuinely sorry,' he said this morning through his publicist. "It's unclear what prompted Pharrell's fashion change, but in a promotional blurb on the Elle UK site, it appears the impetus might have come from the magazine's staff. . . ."
Treye Green added for International Business Times: "The cover was first released on Elle's Facebook page on Tuesday, immediately prompting comments from users upset with the use of the headdress as an accessory. Warbonnets are considered a sacred Native American headpiece, typically reserved for warriors and chiefs. So Pharrell donning one as a fashion statement outraged several people and led to the creation of a #NotHappy hashtag on Twitter. . . ."
Paul DeMain, a past president of the Native American Journalists Association and of Unity: Journalists of Color, Inc., was certified Tuesday as a Democratic candidate for the 29th State Senate seat in northern Wisconsin. DeMain, 58, is a member of the Lac Courte Oreilles Tribe, CEO of Indian Country Communications, publisher of the newspaper News From Indian Country and board chairperson of the Navajo Times Publishing Co. He faces incumbent Sen. Jerry Petrowski, a Republican. No other Democrats filed, avoiding a primary. "We can expect the 3rd parties to run as dirty of a campaign as they can afford," DeMain wrote Sunday on his campaign's Facebook page. "With the Koch Brothers already pouring $900,000 starting this week in Wisconsin in an attempt to shore up the lagging numbers for the current Governor, we can expect the same attack and efforts they recently funded in Iron County for the local Board of Supervisors race. The billionaires have arrived in Wisconsin, and they intend to try to tell you what will make you happy. I don't think OUR Wisconsin wants to buy it, or be bought." Glen Moberg quoted DeMain in a May 20 story for Wisconsin Public Radio: " 'The fundamental reason I want to run is to provide a voice for those people who don't have a voice,' said DeMain. 'Outside influences, individuals and corporations with a lot of buying power behind them, are distorting the voice of what the Wisconsin way of life actually is. "DeMain promises to make the proposed Penokee Hills iron mine an issue. He claims that tribal concerns were ignored when recent mining legislation was drafted. . . .
"There are currently no Native American tribal members serving in the state Senate." DeMain was NAJA president from 1992 to 1994 and from 1997 to 1999, and was president of Unity for the first halfs of 1994 and 1999. With the demise of the American Indian Journalism Institute, which trained college students, and the Crazy Horse Journalism Workshop, which did the same for Native American high school journalism students, the Native American Journalists Association is turning to crowd funding to finance a Native American Journalism Fellowship. The program will operate in conjunction with the Newseum Institute, successor to the Freedom Forum Diversity Institute, which had run both programs but was disbanded last year for financial reasons. "The goal is to help prepare Native American journalism students to enter the workforce by combining the expertise gained from two established programs: the former American Indian Journalism Institute, which was managed and funded by the [Freedom Forum Diversity] Institute; and the Native American Journalists Association’s college student projects held at the annual NAJA conference," NAJA said in an announcement. The two initiatives are melded into a single program designed to give students a range of journalism experiences during a one-year period. . . . The deadline for the 2014 NAJA Fellowship fundraising project is June 30. NAJA said its goal was "to raise $10,000 from members, partners and individuals to make the first year of the NAJA Fellowship a success." "I think its a creative way to get funding for an increasingly expensive program," Valerie Hoeppner, former Diversity Institute education director who taught at AIJI and Crazy Horse, told Journal-isms by email. "This year it's a mix of funding." "Ed O'Keefe was recently hired by CNN to boost the network's digital coverage of politics, a task he's not going to undertake alone," Erik Wemple wrote Tuesday for the Washington Post.
" 'If you're a top talent in D.C., expect to get a call from CNN politics,' says the 36-year-old O'Keefe, whose title is vice president of CNNMoney and Politics. The CNN.com political team now numbers approximately 20 people, according to a network spokesman; the plan is to double that staff in preparation for the 2016 presidential election. Scores of other CNN employees also contribute political coverage on the network’s Web site. "There's a reason why O’Keefe, who formerly served as editor in chief of NowThisNews, is supervising both CNNMoney and digital politics: The network is going to be doing similar things with both of them. CNNMoney is a site within a site — a semi-autonomous Web land — and the network announced yesterday in a memo that it had added 'a new logo, new beats and fresh, inventive editorial.' CNN assumed full control of CNNMoney this week; it had shared management with other outlets. "CNN.com's politics stuff will get a similar treatment. 'We are going to be out there aggressively hiring in the marketplace,' says the New York-based O'Keefe, noting that the hires will be permanent personnel, and not just contractors working on 2016. 'We are making a significant commitment to CNN politics and revitalizing it as a site within a site.' The CNN Digital Network registers just shy of 70 million uniques per month. . . ."
But while CNN is hiring, others are contracting. "People magazine lost roughly a dozen staff members to layoffs and buyouts last week, according to people familiar with the matter," Michael Sebastian reported Tuesday for adage.com. "The departures come just before Time Inc., owner of People, starts to trade independently of Time Warner on Monday, June 9. . . ."
"The owner of the Orange County Register on Tuesday announced a major restructuring that includes staff furloughs, voluntary newsroom buyouts, layoffs and the consolidation of the company's Long Beach newspaper with the Los Angeles Register six days a week," Mary Ann Milbourn reported Tuesday for the Orange County Register. Under the furloughs, nearly all staff of Freedom Communications, the parent company, will be required to take two weeks of unpaid leave in June and July. The Register newsroom, which has a staff of 345, will be offered buyouts, Milbourn wrote. Media Critic Kurtz Says Obama Has "Checked Out"
"Fox News' Howard Kurtz cherry-picked from a Politico article on President Obama to misleadingly portray him as having 'checked out' of the presidency during his second term in order to 'take advantage of the perks of office' like hanging out with celebrities and playing golf," Alexandrea Boguhn reported Tuesday for Media Matters for America. "In a June 3 article for FoxNews.com, Kurtz criticized Obama's actions during his sixth year of presidency, claiming that he had 'greatly diminished clout' and that he had 'lowered his expectations' in order to 'ramp up the partying.' As proof, Kurtz pointed to excerpts from a recent Politico article on Obama's second term . . .
"But the Politico article mainly focused on Obama's recent work on racial issues and political outreach. Kurtz downplayed the outreach angle, portraying it as 'too little too late,' and he completely ignored Obama's work on race. . . ."
Charles D. Ellison, The Root: Where's the Black Political Conversation on Climate Change? "UCLA's Ralph Bunche Center for African American Studies has released its 2014 Hollywood Diversity Report — predictably, for women and minorities, the results are dismal," Phoenix Tso wrote Tuesday for jezebel.com. "And when you break down the minority portion by race, the figures are even more depressing. "The report analyzes 172 films that came out in 2011, as well as 1061 television shows that aired between 2011 and 2012 for the race and gender breakdowns of Lead Talent, Overall Cast, Show Creators, Writers, and Directors. Minorities and women were significantly underrepresented in each category. . . ."
Among the findings: "Minorities represented by a factor of more than 3 to 1 among lead roles in film." "More than half of films had casts that were 10 percent minority or less." "Minorities underrepresented by a factor of nearly 5 to 1 among film writers." "Minorities fare better as leads in cable comedies and dramas." "Minorities more likely to be leads on Reality and other shows than on comedies and dramas in broadcast." William Tompkins, named in 2012 after a national search to the post of president and CEO of the National Newspaper Publishers Association, the trade organization of black-press publishers, parted ways with the group after the board decided he was costing too much money, Tompkins told Journal-isms on Wednesday. Tompkins has been working since May 7 as vice president of advertising and marketing at the Philadelphia Tribune, helping President and CEO Robert Bogle "expand the revenue base," Tompkins told Journal-isms by telephone. He said there had been no announcement, but that the Tribune, a member of the black press that publishes five times a week, planned to roll out new digital platforms. At NNPA, Tompkins said, he raised the profile of the group — the black press is "alive and kicking," he said, contrary to what some believe — but "it was a tough assignment, working around the clock. The board was looking at expenses and what we were doing" and decided to end the relationship, he said. Cloves Campbell Jr., who chairs the NNPA board, did not respond to requests for comment. Tompkins had been hired after a nine-month search and was to be charged with developing a new vision for the organization, which consists of 150 active members and another 50 who are publishing but are not in the association, Tompkins said. Before starting his own consultancy firm, Tompkins held positions at Eastman Kodak and the Washington Post. "If you tell someone about a problem, it's best to offer up a solution," Caroline O'Donovan reported Monday for the Nieman Journalism Lab. "True in real life, and — according to a new study from the Engaging News Project at the University of Texas — true in journalism. Researcher Alex Curry (formerly a writer for Governor Arnold Schwarzenegger!) conducted a survey of 1,500 individuals aimed at learning how people react to solutions journalism, resulting in a report called 'The Power of Solutions Journalism,' coauthored with Keith Hammonds. . . ."
"China's vast censorship machine does its utmost to wipe the slightest reference to the Tiananmen crackdown from books, television and the Internet, scrubbing the issue from public discussion and even from the minds of its younger generation," Julien Girault reported Saturday for Agence France-Presse. Erik Wemple, media blogger for the Washington Post, accepted a Mirror Award in New York Wednesday for "Best Single Article - Digital Media " and implored media executives "to answer media reporters when they call, just like they'd want people to answer their reporters," the Poynter Institute's Andrew Beaujon tweeted from the ceremony. "That now infamous 2004 Associated Press/Annenberg survey — quoted ad nauseam by TV pundits, fans, and even NFL representatives — said that a majority of Native Americans believe the name 'Redskins' is not offensive," Rachael Johnson reported Wednesday for the Indian Country Today Media Network. "Well, according to a California professor, they’re all wrong. James Fenelon, Lakota/Dakota from Standing Rock, a sociology professor at California State University, San Bernardino, compiled his own data, and the results show that 67 percent of Native Americans believe that 'Redskins' is a racist word. . . ."
" 'Good Morning America' co-host Robin Roberts will receive the 2014 Walter Cronkite Award for Excellence in Journalism from Arizona State University’s Cronkite School," the Associated Press reported on Wednesday. "The U.S. Court of Appeals for the First Circuit in Washington has been tapped to consider the National Association of Broadcasters' challenge to the FCC's decision to crack down on joint sales agreements, a move that bodes well for broadcasters, broadcast industry sources said," Doug Halonen reported Wednesday for TVNewsCheck. "Public interest group representatives have been hoping that the case would be assigned to the U.S. Court of Appeals for the Third Circuit in Philadelphia, which broadcasters say has been less friendly to broadcast industry interests than the First Circuit over the years. . . ."
"Without fanfare — or even an official announcement — WMAQ-Channel 5 has added former New York sports and lifestyle personality Siafa Lewis to its daily sports lineup," Chicago media writer Robert Feder wrote Tuesday on his website. "He’s been working as a freelance reporter and sports anchor at the NBC-owned station since May 19. The closest thing to a formal introduction was this tweet May 21 from sports anchor Peggy Kusinski: 'Welcome #NBC5 Chicago’s newest sportscaster @SiafaLewisNBC to Chicago!' . . ."
"When Charles Payne gets recognized on the street, he often gets told something along the lines of, 'I love you on TV, but I'm not in the stock market,' " Merrill Knox wrote Monday for TVNewser. " 'Everybody's in the market,' Payne told TVNewser this morning, citing examples of people who use Apple laptops or drive Ford cars. 'What you have to figure out is — do you always want to be on the consumer side of it?' Bridging the divide between Main Street and Wall Street is a cornerstone of Fox Business Network, and it will be one of the 'great goals' of Payne’s new show, 'Making Money with Charles Payne,' which debuts tonight at 6pmET. . . ."
"The Chicago Sun-Times faced an onslaught of calls for an apology and a retraction after it re-published a National Review op-ed that LGBT advocates are calling 'disgusting and transphobic,' " Joseph Erbentraut reported Tuesday for the Huffington Post. "The op-ed, written by right-leaning correspondent Kevin D. Williamson, is titled 'Laverne Cox Is Not A Woman' and repeatedly misgenders the 'Orange Is The New Black' actress and trans icon, who is gracing the cover of the latest TIME Magazine. It also raised offensive questions concerning Cox's anatomy. . . ."
On June 28, the 45th anniversary of the 1969 Stonewall uprising, the nonprofit oral history group StoryCorps will inaugurate OutLoud, a three-year project to capture the experiences of the "the lesbian, gay, bisexual, transgender and questioning community," Elizabeth Jensen reported Sunday for the New York Times. "In particular, the project will seek stories from young people, minorities and those who lived before the uprising, which was a response by gays to a police raid on the Stonewall Inn in Greenwich Village and helped precipitate the gay rights movement. . . ."
"Why shouldn't the public get federally funded research that evaluates whether local news outlets are meeting their information needs?" Carla Murphy asked Sunday for Fairness & Accuracy In Reporting. "This is what the FCC's pilot study had sought to do." Murphy was defending a controversial planned FCC research study that included interviewing local journalists about how they choose what to cover. The FCC backed off in February after criticism from news organizations. Murphy continued, "Also, mainstream media are less friend, more foe on a variety of issues of particular concern for racial and ethnic minorities. Especially in a society where segregated neighborhoods and schooling is the norm, it's appropriate to systematically evaluate whether 50,000 overwhelmingly white, male journalists are meeting the news needs of people of color. . . ."
Oluwatoyosi Ogunseye, the editor of Nigeria's Sunday Punch newspaper, revealed that a manufacturing plant's fumes were making its neighbors seriously ill. Alejandra Xanic von Bertrab, a freelance reporter in Mexico, showed how companies flagrantly violated the law, in some cases causing massive deaths and injuries. The pair won the 2014 Knight International Journalism Award, the International Center for Journalists (ICFJ) announced on Friday. Reporters Without Borders, reporting on Mexico, said Tuesday it was "saddened to learn that the body of Jorge Torres Palacios, a journalist based in the resort city of Acapulco, in the southern state of Guerrero, was found outside the city yesterday, four days after unidentified gunmen kidnapped him from his home. Torres worked for the Acapulco's public health department as press spokesman and wrote a political column called 'Nothing personal' for El Dictamen de Guerrero, a weekly newspaper. His body was found near a cemetery, semi-buried and bearing the marks of torture. . . ."